I'm sure you didn't mean it to come across as such, but you effectively compared Cynthia's 'value' to that of a motorcycle and fur-lined coat. We didn't mean that at all! Haha...just comparing how Cynthia is better than Chad. If you enjoy Cynthia, it is still worth-watching. We agree. Sometimes all a movie needs is a memorable Carradine. This one was decent, I don't mind McQueen, he was pretty good in Firepower, Fall:The Price Of Silence, and New York Cop. 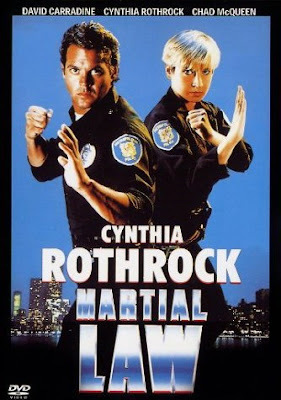 Interestingly enough, Jeff Wincott was also in the excellent Martial Outlaw, which despite the title is completely unrelated to the Martial Law series. Definitely agree he wasn't that bad in Firepower (Review coming soon) Saw Martial Outlaw a few years ago and it was really good. Have to get a copy! This wasn't a "bad" movie - just a little disappointing. Carradine was great, Rothrock and Tan were good, but McQueen was mediocre - and that's if you don't compare him to Steve (in which case - shameful). I must admit I have a nostalgic soft spot for this type of movie, filmed in this era, and was entertained for 90 minutes. Rothrock was great in this. She was weighed down by McQueen. Thankfully the sequel was way better.